The EPBM is a sealed system that balances active earth pressure and hydrostatic pressures in front of the EPBM, and it’s suitable for varying ground conditions both above and especially below the water table. The EPB operator balances external pressures by adjusting the machine advancement against the rate of material extraction from the cutter chamber. 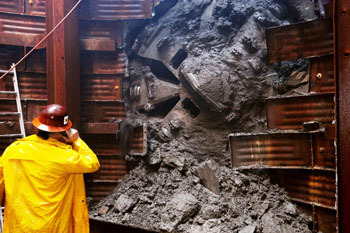 Excavated material is continuously conditioned to provide a homogenized waterproof soil mixture by the addition of foam, bentonite, and polymers to the cutting chamber, cutter bit and screw conveyor. This enables the cutter head operator to maintain the desired cutter head torque and face pressure to balance the pressure of the existing soil at the cut face. 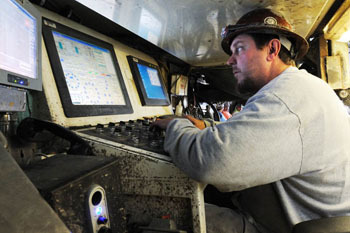 EPBM’s are compatible with pipejacking and tunneling support methods. The STBM is a sealed system that provides continuous pressure to the face of the excavation to balance active earth pressure and hydrostatic pressures in front of the STBM. The STBM is suitable for varying ground conditions primarily below the water table. Excavated material is removed via slurry discharge lines and placed into a separation plant where the slurry is separated and recycled. The flow velocity and the pressure is carefully regulated so that the slurry chamber pressure can effectively counterbalance the groundwater pressure. 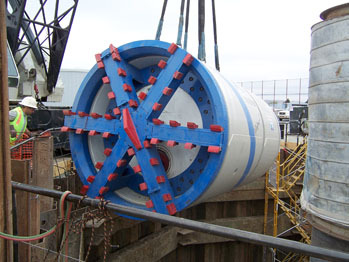 STBM’s are compatible with pipejacking and tunneling support methods.